We started our day with the team meeting, where we learned that another team cleared scrutineering and would be starting with us on the at the beginning of the race. The meeting went well and our drivers got any uncertainties cleared up; they were ready to race. Following our meeting, we had the FSGP picture. For this, the teams that had qualified to compete lined up in their order in the Hot Pit (where our drivers would pull our cars for quick fixes, like tire changes or driver switches), followed by the teams still scrutineering. As we waited for the rest of the teams to line up, we performed our Stretch and Safety Circle with the a few members of Michigan's team and a few of the Formula Sun volunteers. Finally, it was time to line up for the race. Michigan lined up first, followed by Minnesota. Poly Montreal had the third position, but the need for repairs kept them to the side of the track for the starting flag. Kentucky, Illinois State, Appalachian State, and Principia were also with us at the starting line. At the flag, Michigan was able to quickly accelerate down the hill while Minnesota led the rest of the pack. 11:30 AM - Our first driver, Kory Soukup, has qualified for the American Solar Challenge with the necessary 33 laps. 12:08 PM - Everything is running perfectly well, Eos has been extremely consistent without any problems. We are 2 hours into the race without any issues or a pit stop. 12:14 PM - ETS Quebec and Toronto have joined the rest of the field on the track. 1:00 PM - Eos suffered a mechanical issue while on the track, coming out of a downhilll turn. Our driver heard a loud pop and felt the need to pull off the track. 1:05 PM - Support crew made it to Eos on the track. 1:30 PM - Used a spare part to make the repair, which was completed onsite. Eos was able to then continue racing. 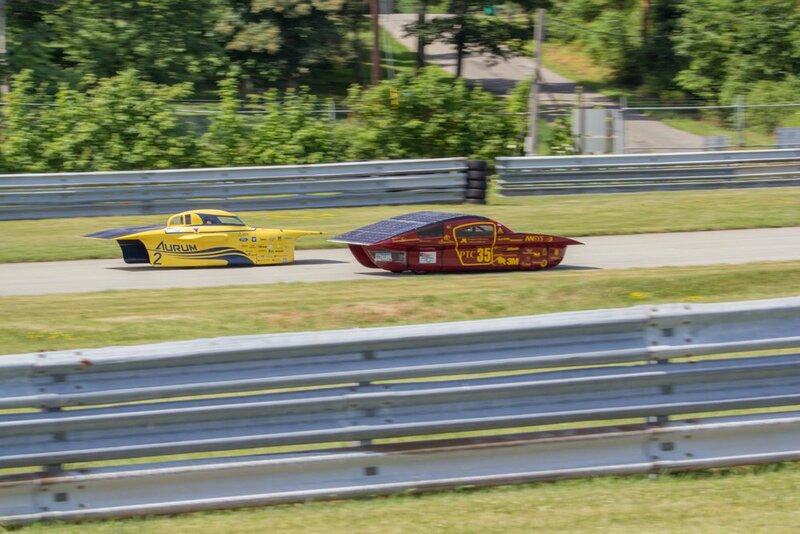 We are still on track to qualify for American Solar Challenge. 2:00 PM - Minnesota has completed 72 laps. 2:01 PM - Eos popped the front passenger tire. Support Crew got on the field and replaced it quickly. 2:10 PM - Eos came into the hot pit, and Chris Yamaguchi switched with Kory Soukup as the driver. 3:00 PM - Minnesota has completed 86 laps. 3:48 PM - Minnesota has completed 100 laps. 4:03 PM - Minnesota has completed 105 laps. 4:11 PM - Chris Yamaguchi has qualified for the American Solar Challenge with 33 laps in the Formula Sun Grand Prix. 4:48 PM - Red Flag required that all vehicles pulled over at their current location, for which many stopped together on a hill out of sight from the track observation areas. After the track was cleared and it was safe for the cars to proceed, there was a minute of confusion as they figured out how to start on the hill, but Eos managed to get started again and is once again counting up on her daily laps! 5:00 PM - Minnesota has completed 119 laps. 5:33 PM - Minnesota has complete 128 laps and qualified for the American Solar Challenge! 5:45 PM - Minnesota has completed 132 laps. 6:00 PM - Minnesota has completed 140 laps and pulled off the race track. 6:15 PM - Our array has been normalized and our battery will be charging until we have to impound our battery at eight PM. 8:00 PM - Eos received one penalty lap and our total lap count is 139 for today.